More than 8 percent of people in the United States (who are older than 11) suffered from a substance use disorder in 2014, according to the National Survey on Drug Use and Health (NSDUH). Treatment for addiction is complex and multifaceted. Across the board, it’s believed that support from others is an important aspect of recovery. Narcotics Anonymous (NA) is a nonprofit organization that hosts 63,000 meetings a year in 132 countries around the world. A peer-support program set up around the 12 Steps for recovery, Narcotics Anonymous is a fellowship of people in all stages of recovery from substance abuse who work together to achieve sobriety and remain drug- or alcohol-free. Not to be fooled by the name, NA is open to all people struggling with addiction to any mind-altering substance and not just to those in recovery from narcotic addiction specifically. In Narcotics Anonymous, members work through the 12 Steps by learning to accept that their addiction is beyond their control and to relinquish that control to a higher power. The concept of God is prevalent in NA, although the organization has no religious affiliation and is considered non-secular. Members are encouraged to see God however they choose and to find a spiritual awareness and a level of faith that helps them heal and remain abstinent from drugs and alcohol. All are welcome at Narcotics Anonymous meetings regardless of race, color of skin, culture, religious affiliation, professional nature, gender, or social class. The only requirement for becoming a member of NA is a desire to stop using drugs or other mind-altering substances. Individuals do not need to fill out any paperwork or submit to an evaluation or interview before attending a meeting either. NA is free to attend and join. Members may choose to contribute to the group in the form of a donation, as the groups are all self-funded and contributions must come from within. External forces are excluded from NA, and the group has no ties to any medical, mental health, religious, or government agencies regardless of where meetings are held. NA groups often meet in treatment centers, hospitals, or churches but are independent of these locations. Meetings that are designated as “open” are for the entire community while “closed” meetings are just for those suffering from drug abuse and addiction. During an NA meeting, individuals may be greeted with a hug, and newcomers may be given a keychain. Meetings are generally performed in a circle where all attendees are facing each other, promoting a feeling of inclusion. Participants are asked to keep everything shared in these meetings to themselves, and not to share with others outside of meetings. People may introduce themselves by first name at the start of a meeting, but this is not required. Narcotics Anonymous meetings generally follow two formats: “speaker” and “discussion.” Speaker meetings will have one or two members sharing their experiences, while discussion meetings encourage everyone to share something. These discussion meetings are not meant to be actual back-and-forth discussions; instead, each person shares a personal experience or insight related to addiction or recovery. A break may be built into the meeting for refreshments or socialization. Otherwise, participants are asked to save side conversations to the end of the meeting. Meetings usually begin and end with a prayer and also typically include the passing of a collection plate. Meetings may include excerpts from the Basic Text, Narcotics Anonymous, which is usually available on site for purchase. The basis of an NA meeting is to share recovery with a group of peers who can be empathetic and understanding in order to provide support and guidance to each other. 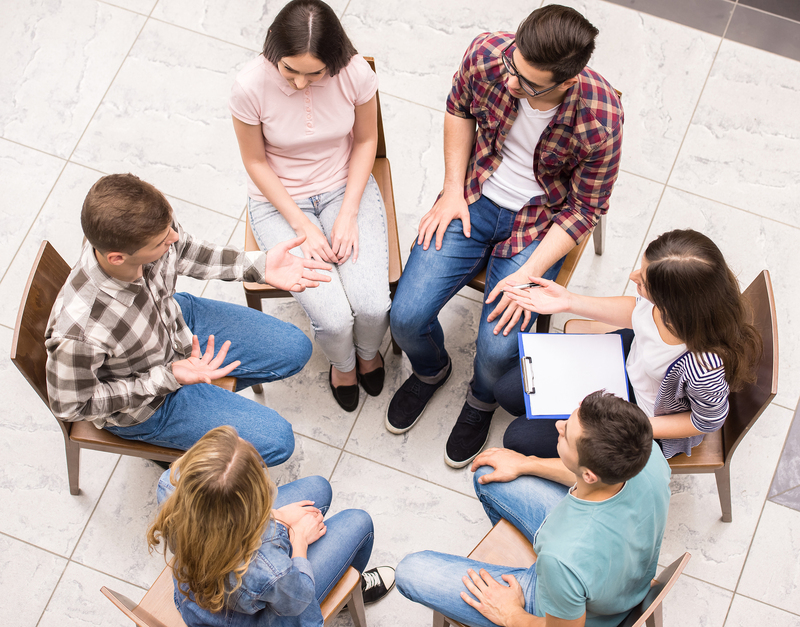 As published in the journal Alcoholism Treatment Quarterly, support groups, such as faith-based groups like Narcotics Anonymous, can help individuals to reduce stress and improve overall quality of life, thus enhancing recovery. Stress is often a precursor to drug abuse and relapse, and peer-support groups can help participants learn tools for stress management and reduction. The spirituality of NA may play a role in reducing stress as well. Turning recovery over to a higher power and recognizing that with faith comes hope can be uplifting. The influence of positive peer pressure may help to reduce drug cravings and lessen the likelihood of relapse. Recovery can feel isolating at times, as individuals say goodbye to friends who they used to use drugs or drink with. Narcotics Anonymous can give individuals a sense of community and a feeling of belonging. NA may also be able to provide participants with a sense of purpose, as the 12 Steps encourage members to pass the message on to others who may need it. Veteran members are often paired up with newer ones as a “sponsor” to guide them through recovery and be a lifeline for them whenever they may need one. When someone has difficulties staying motivated, becomes complacent, or is impatient with recovery, other members of NA can step up and offer support. Sometimes simply hearing how others dealt with roadblocks in recovery can help someone to navigate their own difficulties in recovery. Meetings are offered at many different locations and times, and individuals may attend as many meetings and different groups as desired. Meetings may vary in size and style, from larger and louder meetings, to small and intimate meetings; it is important to find one that feels like a good fit. Each NA group may operate slightly differently, and those battling addiction are encouraged to try different groups until they find one that works for them. It’s recommended that new members keep going to NA meetings for at least 90 days to fully explore all the program has to offer. Newcomers should go early, ask questions, and stay late in order to get the most out of the meeting. The Narcotics Anonymous Meeting Search function the NA website is an interactive tool that can be used to find local groups and meeting information. Substance abuse treatment providers or specialty facilities where individuals may receive treatment can be a helpful resource for local group information. Medical or mental health professionals may have information on local NA groups and meeting details. Community organizations, nonprofit groups, and churches may also have resources on local NA meetings, or they may even host onsite meetings. The support given from peers in social support groups like NA may be invaluable. Psych Central reports that a strong social network , or peer support group, can greatly enhance recovery. Narcotics Anonymous can be a great adjunct to a comprehensive drug treatment program.